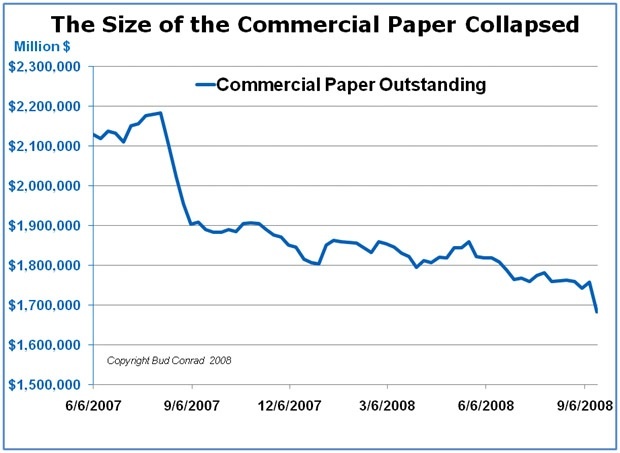 The commercial paper market broke down Thursday. It is a measure of just how much confidence has been lost in this traditional market for short-term loans to the largest and most secure companies. There are no buyers as rates jumped. A source of the loss of confidence came from the money market funds, which face redemptions from customers that are concerned that their money is no longer safe. The Reserve Primary Fund announced that its fixed value of $1 per share was broken meaning investors lost money. Putnam Funds said it has closed its institutional Putnam Prime Money Market Fund because of redemptions. The loss of confidence in the markets jumped on the fears realized after the collapse of Lehman Brothers. Lehman had debts in many institutions that now found they had losses. 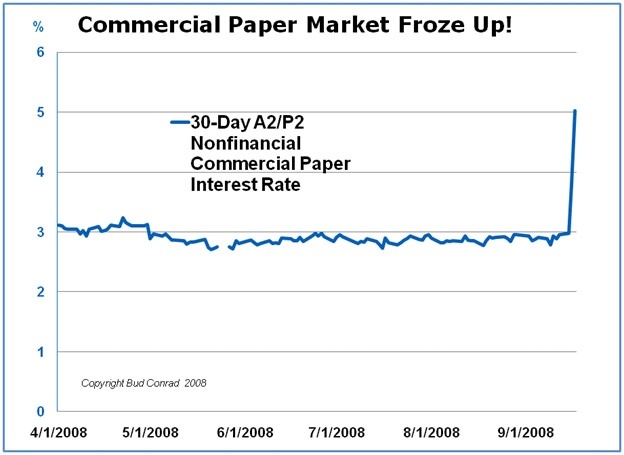 This crisis is reminiscent of the Auction Rate market, which is still frozen. If big corporations can’t get access to borrowing at reasonable rates, the credit crisis has certainly expanded way beyond the subprime housing market. The problem with the credit collapse is that it is a psychological base of loss of trust in the counterparties and the system. The Fed’s response is the huge $180 billion of new swaps to foreign central banks on Thursday to try free up some of the markets. Other central banks added to this liquidity. This is a panic reaction, not a final solution. Washington, D.C., Sept. 19, 2008 — The Securities and Exchange Commission, acting in concert with the U.K. Financial Services Authority, today took temporary emergency action to prohibit short selling in financial companies to protect the integrity and quality of the securities market and strengthen investor confidence. The U.K. FSA took similar action yesterday. This is the stuff of depression. The freeze-up is why the government is acting so precipitously to head off the problems. But the capricious actions of letting Lehman fail and at the same time bailing out AIG are not helpful, as participants don’t have guidelines of what to expect. The bailing out of Fannie and Freddie will cost taxpayers more than they can afford, and the result is what I call putting big logs on the fire. They dampen the fire for a while, but then catch on and burn hotter. The Fannie and Freddie bailout will eventually be very inflationary. The scarcity in the credit markets has its roots in the collapsed source of funding from foreigners, who sold off holdings in August 2007 and again in July 2008. Foreigners are taking away chairs from the U.S. game of musical chairs when they slow their contribution to our credit markets. 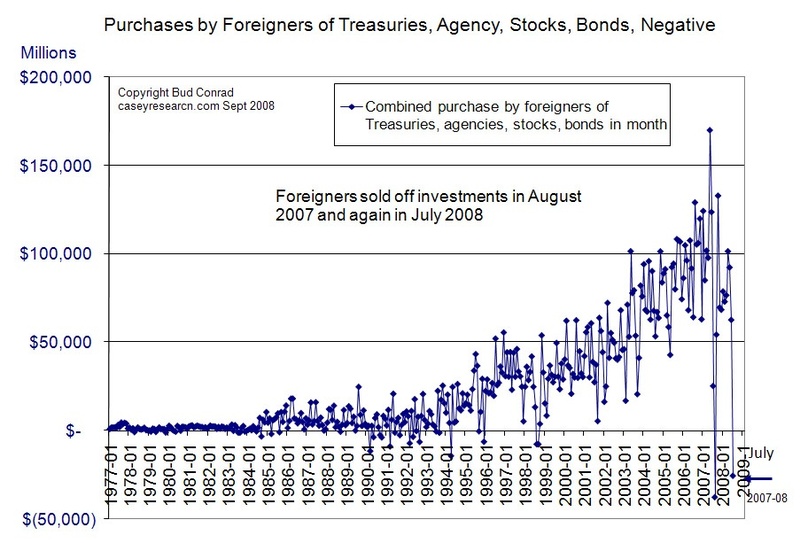 The international connection of foreigners holding power over the U.S. monetary policy is seen in the world markets on a monthly basis, as well in the U.S. markets on a daily basis. They are connected. And unfortunately the accumulated trade deficits make the U.S. vulnerable to foreigner actions. The long-term implications are that the crisis is getting worse, not better, and that it can’t be solved by internal policies acting alone. We are in for a long shift downward of the U.S. position in the world. The surest way to fortune in strange times like these is by investing in big market trends. For 25 years, Casey Research has been providing investors with insightful investment newsletters – and now their new flagship publication, The Casey Report, zeros in on the big trend targets of the day. To find out how profitable this approach can be – and what it can mean to your portfolio to be on the right side of the trend – click here now.